It is shocking for many parents to see that their kid has turned stubborn right from the age of infancy. They want to do things their own way and they won’t mind moving their head in denial every time you want them to listen to you. Parents try different things like cajoling, getting angry, screaming, bribing, but at times nothing works. 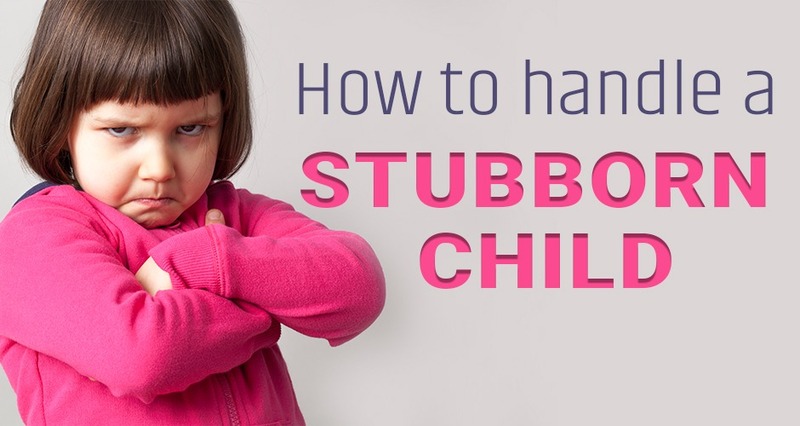 Here we list the best ways on how to deal with stubborn kids. How to deal with stubborn kids? You must not worry if your child is too stubborn because it is often proven that stubborn child who has a strong will, succeeds better in future and turns out to be a great leader. No doubt it becomes difficult and challenging to understand how to handle a stubborn and aggressive child, but trust me if you keep some patience and make your stubborn toddler understand that his behavior just doesn’t work in his favor, you will be able to solve the problem. Sometimes parents become more aggressive and stubborn than the child. Firstly, you need to calm down and listen to your lad. He must realize that you are simply not negating him and instead you are trying to understand his point of view and agree to him. If his demand sounds sane and agreeable, accept his wish. If it doesn’t, then you need to make him understand why you cannot settle to his wishes and why he should do what you suggest. We assume that since our child is just a few years of age, he is not mature or mindful enough to understand us, but in reality, the children are smart enough to comprehend us. Hence, listening to him calmly should do the trick. Arguing will not help ever. The child will become even more belligerent. Do not force him, rather try to divert him. For example, if your child is not eating the food you want to him to have, rather than forcing him you could try a different way. Start talking about his favorite cartoon character or the latest movie you two have seen together. You can also spend the time talking about the impending picnic you both are planning to enjoy, while you feed the food to him. The child will become happy and involved, and will not realize what he is eating. A plain “no” might upset your child to the core. It is worth negotiating with your cute little lad, isn’t it? Give him options. If your child has picked up an expensive toy from the toy store that does not suit your budget, tell him to select from the options you give him, else he won’t have any of them. Try to remain as calm as you can while you negotiate. You may have to repeat this quite a few times till he agrees and looks contented and happy. Getting angry and shouting will never help. The key is to play smart and get things your way without even yelling. Keeping patience and thinking of tactful ways will yield better results. It is important to remain calm and for that you might have to learn ways. Keep giving frequent surprises to your kid. Buy unannounced gifts for him or let him watch his favorite TV channel for an extended time, telling him that today is his bonus day! This way you will become your child’s favorite and he will argue with you lesser in future. If your child knows well that no matter what, he has to be on the bed by 10 pm in the night, the chances of arguing for some extra playtime are less likely. You must have a definite set of rules and your child should be well versed with it. Though while drafting the rules, you must take care to listen to your child as well. Respect his opinions, empathize with him, agree to some of his wishes, and seek his cooperation to make unanimously agreed set of rules. One of the most important tasks of being a good parent is to spend time with the kid. Talk your heart out with your child. Listen to him like how did he spend his day, what did he play today, what did his teacher teach him, etc. This way you will be able to create a stronger connect and bond with him. When you have a strong connect with your baby, he will tend to listen to you more and become less stubborn. You need to sound positive almost all the time. Your child will become rebellious hearing the words like “no”, “don’t”, “stop”, etc. all the time. Talk positively such as instead of saying, “you cannot do this”, say “we will do this if you…”. Also, instead of giving him directives, ask the sentences in the question form to which he can say a yes. This way he will feel that his opinions are sought and he is heard.